I cant thank everyone enough for the great advice and ideas on my family room- so thank you!! While the BF is still not on board with painting the side table blue like the walls, I am starting with some new pillows to bring the wall color down into the room a bit more. I also worked on my chair a bit- its going to be white with a creamish linen-type fabric. This way I can add a pretty throw and pillow to it but it also brings the white of the couch to the other side of the room. I KNOW everyone said do a color on it- but since I can't make up my mind and I'm always changing what I want, I figured this was the best choice for now. 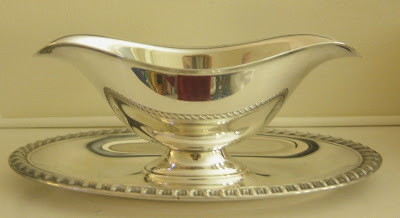 Also found these great silver plated (I'm assuming they are not sterling silver, but they don't say) gravy boat and sugar holder. There was no creamer to match the sugar holder, but again it's ok because I will use it for something other than its intended use. Now I've got to get to work on my new blue pillows- I think the room is finally coming together! PS- don't forget about our Boston Blogger event on Wednesday- if you are around, stop on by!! 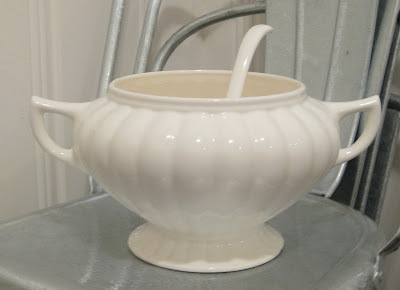 Love the soup tureen, great find! look at those finds and that fabric! FABULOUS! the blue is so pretty. love it next to the pillow. tell the bf he might be slightly design retarded. and the goodwill turine is perfect for the halloween party!! i wish i was coming!! Love all your finds! That soup tureen is so gorgeous. And I love a cream-colored chair. 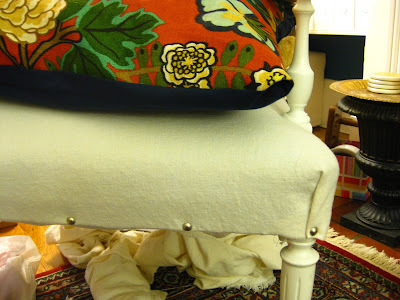 Don't you want to do a step-by-step on how to redo a chair? I am so curious! I keep seeing chairs on CL and wondering if I could do that! Yay for great goodwill finds! and love how the room is coming along. Great finds! I'm always on board for a white chair with fun throw pillows! Such the best way when you're always wanting new design updates! Lookin' good and great GW finds! I love the color of the pillows! Cannot wait to see the finished product! 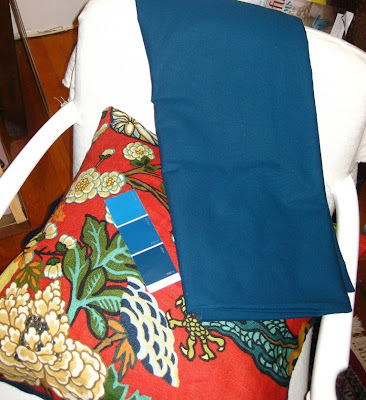 Love that blue fabric - it's perfect! Which Goodwill do you go to? The huge one on Harrison or somewhere else? I've been to that one, but must've hit it on an off day. i didn't see anything like the pieces you found! Love the chair color and the blue fabric. I can't wait to see the finished product. I nominated you for an Honest Scrap Award. Come by my page to get the details. A plant in the tureen on the sideboard or even a small plant in the sugar holder would be nice, I think! Love that blue against the floral fabric. You are very good at these tasks you take on! Can't wait to meet you tomorrow! awesome finds!!! i think you'll be happy to be able to change your mind whenever you want with the neutral chair.. i wish i could meet you guys tonight for drinks!!!! how fun!! !